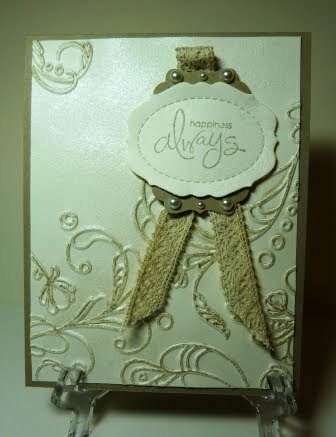 Thanks to the TLC on Splitcoast, here’s a new twist using your embossing folders. Try coloring the indented part of your embossing folder with your markers. Using my Crumb Cake Stampin’ Write Marker from Stampin’ Up! I colored the Elegant Lines embossing folder. Next run it through your Big Shot/Cuttlebug with a piece of Very Vanilla cardstock. Now I added a little bling by adding Smooch Spritz in Vanilla Shimmer over the entire piece. Then the piece was placed on a regular A2 sized card in Crumb Cake. Then I cut a strip of Victoria Crochet Trim and the same length of 3/8″ Very Vanilla Taffeta ribbon. And, used Sticky Strip to adhere them together. Next this was sponged with Crumb Cake. The Decorative Label XL punch was used for the bottom layer of the sentiment treatment. Followed by a piece of Very Vanilla, against spritzed with the Vanilla Shimmer and stamped with the sentiment from Whimsical Words. The label is from the Lots of Tags sizzlet die. Added a few Basic Pearls and done! All products from Stampin’ Up! Try this technique with a variety of embossing folders and colors and see what you can come up with!